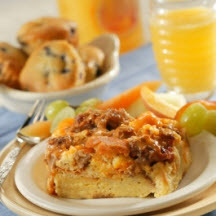 CooksRecipes has quality, kitchen-tested recipes for a variety of breakfast casseroles made with sausage that you can count on for successful deliciousness. 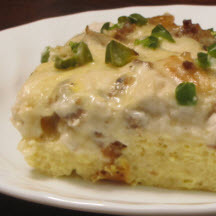 The best of a country breakfast of "scrambled eggs" with "sausage gravy and biscuits" combined in one delicious breakfast casserole. 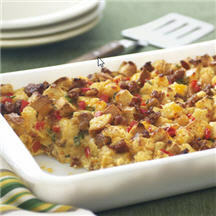 This is an easy, hearty casserole that is just right for breakfast, brunch or supper. This dish is made easier by mixing it the night before. A good addition to a brunch buffet or as a holiday breakfast.